Description: We picked our very best tools and put together the expert's kit. These are absolutely the tools we use on a daily basis. Want to begin making, but don't know what tools you need to start? This kit has what you need! Note: The solder spool in this kit is leaded. We prefer using leaded solder on prototypes or other non-production type things - it's easier to work with (flows better). If you're new to soldering, the leaded solder will make things a bit easier. 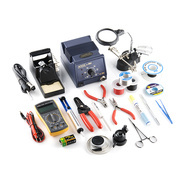 Analog 70W Soldering Station Variable Temperature - Lead free compatible! Be sure to checkout our Surface Mount Soldering Tutorial and ourSMD soldering guide.